Through innovative partnerships like these, as well as participation in the "Iams Have A Heart: Home 4 The Holidays" program (see below), AC&C adoptions were up 128 percent in December, with nearly 1,000 pets finding "homes for the holidays" and beyond! Home 4 The Holidays: Queens-based Animal Haven, www.animalhavenshelter.org, launched its holiday pet adoption campaign with Mike Arms, founder of the national "Iams Have A Heart: Home 4 The Holidays" at Fetch on the Upper East Side on November 17. 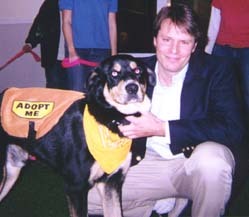 People who adopt from Animal Haven during the campaign will receive a free Iams kit of food samples and pet-care tips. They'll also be eligible to take the "Have a Heart Pledge" and win a lifetime supply of Iams food. 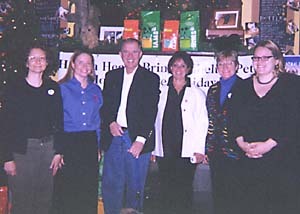 Pictured here for the kick-off are (left to right) Janell Granier, director of programs, Mayor's Alliance for New York City Animals; Alicia Dixon, Iams; Mike Arms, founder, "Home 4 the Holidays" and president of the Helen Woodward Animal Center, San Diego; Sherri Morant, Iams; Jane Hoffman, President, Mayor's Alliance for New York City Animals; Jennifer Bristol, Associate Director, Animal Haven. 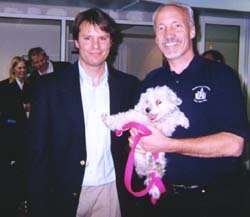 Cat Café Delivers the Latte: Meow Mix CEO Richard Thompson (left) and ASPCA President Ed Sayres (right) in the ASPCA's Urban Cat Habitat at the ASPCA's 92nd Street headquarters. 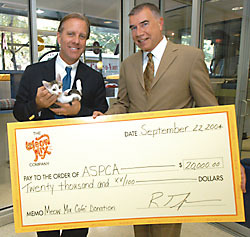 Meow Mix donated $20,000 to the ASPCA--proceeds from the Meow Mix Café--which operated for two weeks during August in Times Square to introduce the company's new line of wet cat food. 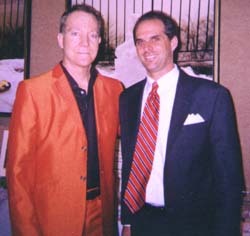 Love Cat: Fred Schneider of the B-52s (right) hosted a special "Cats In the City" art exhibit at the National Arts Club on November 1. The multi-media exhibit featured artwork from artists like Peter Max, Martha Szabo, cartoonist Dan Piraro ("Bizarro") and book signings by Valerie Shaff (I Am The Cat, Don't Forget That). Proceeds benefited Neighborhood Cats and the Humane Society of New York. 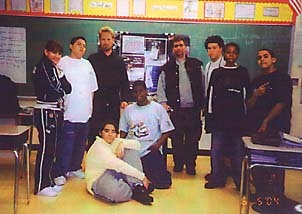 Pet-ucation: Jeff Ecker (black vest, right of center) executive director of Project Whoopee Human Society in the Bronx on a visit to a neighborhood school. Project Whoopee seeks to educate kids and others on responsible pet ownership such as proper training, spaying and neutering, and, of course, adoption. Are We There Yet? - Sophie the "tailgating cat" checks out Jets stadium in the Meadowlands last August 27 during the pre-season New York Jets-Giants game. 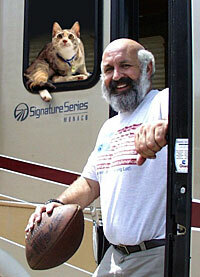 Sophie's owner, Joe Cahn, is the self-proclaimed "Commissioner of Tailgating." His goal in 2004 is to visit 50 football stadiums with Sophie, cooking and getting publicity for the luxury Monaco Coach he crosses the country in.